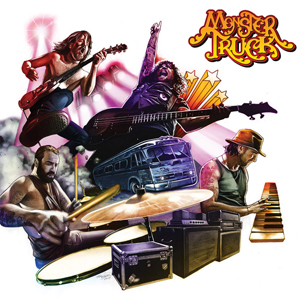 MONSTER TRUCK return with their brand-new studio album True Rockers, which will be released on Mascot Records/Mascot Label Group on September 14th. It’s been two years since the mighty Sittin’ Heavy came out and in the 18 months that followed its release, they played over 150 shows, which included arena tours with NICKELBACK, BILLY TALENT and for the final ever European DEEP PURPLE tour. They also shared the stage with BLACK STONE CHERRY, VOLBEAT, THE TEMPERANCE MOVEMENT, JANE'S ADDICTION, ROB ZOMBIE and ALTER BRIDGE. The band embarked on their biggest European headline tour to date selling out venues across the continent and thundered through mainstage festival slots at RockPalast (Germany), Ramblin’ Man Fair (UK), Download (UK), Rock on the Range (US), Shiprocked (US) and Rock in Vienna (Austria) amongst others. During the time on the road the band took a recording rig on tour and songs came together for what was to become True Rockers. They began to send material back and forth to producer Dan Weller (SIKTH, YOUNG GUNS, ENTER SHIKARI). “When the inspiration strikes, use it, if you’re not gonna use it, you’re wasting it” says frontman/bassist Jon ‘Marv’ Harvey, “as soon as you think of something could be a good song, work on it, immediately. Inspiration is so valuable.” They then returned to Echo Mountain Studios in Asheville, North Carolina in July, 2017 to record the album. Album opener "True Rocker" is a statement of intent and features Mr "I Wanna Rock" himself, Dee Snider (TWISTED SISTER). “He’s a true rocker, who’s more perfect than Dee Snider?” says Harvey. >"Thundertruck" is another juggernaut and was originally from the Sittin’ Heavy sessions but was abandoned. Widerman says. “We had worked on that with me playing that lead part, and it left a big gaping hole in the heaviness of the song. Once we shifted that line over to the organ, we were like, this is awesome.” "Devil Don’t Care" oozes blues-rock swagger and tackles the notion of people staunchly rooted in religion and they explore real depth in the emotional "Undone" which was written about people that struggle with addiction and the feeling of hopelessness, while album closer "The Howling" poses the question, are spirits real? The album had been put to bed but the band were still bouncing around ideas and they had the opportunity to work with award winning producers Gavin Brown and Maia Davies on songs "Evolution", "Young City Hearts" and "Hurricane". “We had a chance to work with some hit makers so we took the chance, and what came out is different than anything we have done. Gavin and Maia were fantastic to work with. It added a lot of color to the record and allowed us the opportunity to take a risk and branch out a little,” explains Harvey. Elaborating further Widerman adds, “It almost wouldn’t be a MONSTER TRUCK record if we didn’t reach the supposed end of the process and then double-back to track a few extra songs in order to strengthen what was already a strong record to us." “I know who I am, A true rocker, I am a true rocker, I feel the music from inside baby, from within, I'm good to go on just about anything, No time for brakes we move full speed ahead, I know who I am, a true rocker” - "True Rocker"